Very much agree Slasher, there is not much Shite left to give. I predict we will see a lot more guys leaving towards the middle of the year ready for their kids to start school back home or wherever at the beginning of the new school year. Big recruitment going on for BA, if you don't go now then you'll miss your chance to grab a place on the seniority, leaving it a few months to see what happens here will leave you years behind for eventual upgrade. So true, what a lot of the younger guys don't realise is that hiring booms don't last forever. Sticking around at CX hoping things improve, or waiting for an upgrade, only serves to lower your seniority number at proper, legacy airlines. These airlines are hiring massive numbers, but it could all end tomorrow. The trick is to get in as early as you can, lock in a seniority number and enjoy your life in your home country close to family and friends. You have but a single life to live, no second go. This will be your one and only life you ever get. Make the most of it. Not one person I've talked to that has left CX has regretted their decision. In fact they wondered why they didn't do it earlier!. CX will be left with those who have no option but to stay. Guys getting their A350 upgrades are seemingly a happy bunch . B777 Skippers are not leaving in any numbers higher than the industry norm for natural wastage eg retirement and or sickness. .
You comments sir , are unsubstantiated baloney . 1) I already have a punchbag, but you misunderstand; I don’t feel frustrated filling in the engagement survey. It’s honestly quite hilarious knowing that for some unfathomable reason, you’re being gifted an opportunity to point out, in detail, how terrible things are, in the full knowledge that it’s mandated that those views have to be made public! Of course, in isolation it won’t suddenly solve all the problems, but our resistance method has been to apply death by a 1000 cuts. For the majority of players (by definition) who sit in the middle of the bell curve of opinion, the rhetoric on Prune, the forums etc can potentially be dismissed as being from the more extreme in their views, For anyone (not talking about myself) lacking conviction, to know that the terrible results of the survey come from roughly half of the entire pilot body must embolden them to continue CC, vote No etc. I would at least think that those of you with reservations on the principle of engaging would welcome any strengthening of the masses resolve? 2) Unitedabx - you spelt/spelled, (take your geographical pick), “...f***k...” incorrectly. Last edited by White None; 10th Mar 2019 at 03:15. Green Dragon, sure, everything is just fine here. No resignation problem whatsoever. That is why they can't even allocate half the required leave this year, and why they are having to put in more and more reserve on the roster, and why they are desperate to get rid of the TB. I could go on, but according to you things are just dandy, so why should I bother. CX has NEVER been better. It's all just unsubstantiated baloney. Cathay doesn’t have a pilot shortage, just a surplus of airplanes. A functioning, well led, HKAOA would wait till the survey comes out, copy the questions and do the survey on the HKAOA website, encouraging 100% participation rate by members, analyse the “true” data and “sell” it back to the company! However, it seems the GC and membership are intent on bickering and backstabbing instead. The plan is to skip off into the Sunset. I didn’t make it up. That is an actual poster seen in Kittyland. as they leave to join their new airline !!! 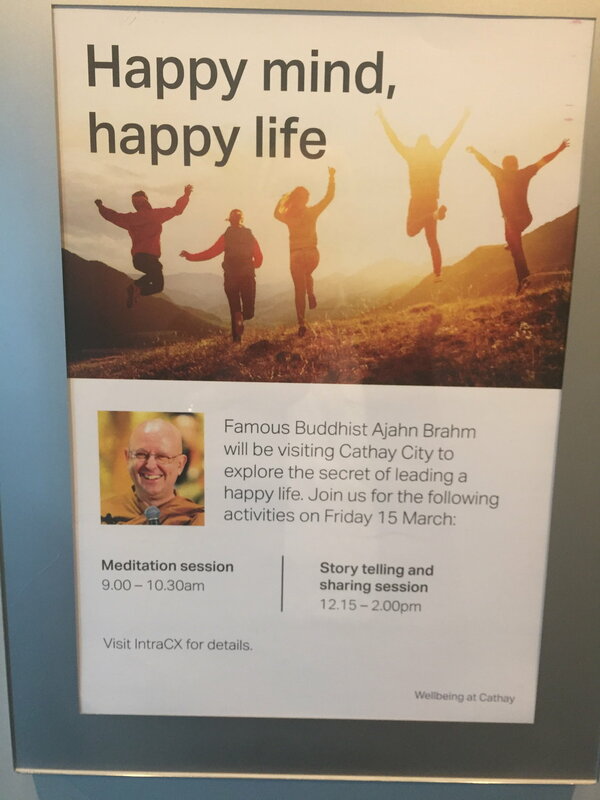 Be hilarious if the 'Famous Buddhist' proclaimed the Secret to Happiness is getting the [email protected] out of Cathay! Never thought it could happen. Didn't believe it when I saw it. But yes, this is where we have gone. Let's make 25 March a day to meditate and NOT aviate, navigate or even communicate. I feel new uniforms on the way...lots of orange flowing stuff and free begging bowls and a bell. You can't make this taurus excretus up...it must come with an Oxford primer. Let's get a bunch of Max8's or a bag of Nembutal. I have always filled in their BS surveys, but never again. “How would the DFO begin his email?” Indeed. There couldn’t be a stronger message sent. You cannot polish a turd but you can cover it in glitter. Regarding the survey, I hope not a single pilot submits. As for promoting a Buddhist monk and the message he has, well, I am sure that CX is soon to invite a devout Christian to also provide a positive message, then they can have a follow up by someone from the "religion of peace". This is just another piece of evidence that this airline is finished, and that our management have lost the plot. I barely get enough time with my family as it is without wasting another minute of it listening to someone that thinks I have the same value as a beetle (I know, that's exactly what our management value me at!). Seriously CK and RH, would you two get some medication and grow up? This is now passing from tragedy to farce, and YOU are the cause of it. The opposite of love is not hate. It is apathy. When people really don’t give a shite anymore you are not in a good place. That way,"Caring Company" gets a good result in the survey from the perfect demographic.. Win win. I've wasted enough of my life completing worthless CX surveys. They obviously haven't listened to a single thing we've told them so why bother. I'd rather they learn the lesson by finding a way to deal with the exponentially increasing resignation rate. That's one "answer" to a question they can't keep ignoring. They obviously haven't listened to a single thing we've told them so why bother. Management don't want to listen, they want us to feel like they've listened to us. DFO fully admits as much in his engagement survey update. The survey is just a tool for us to feel like we're being listened to. No more surveys for this old cowboy now that I know what they are really for. The Engagement Survey is essentially the same as Yammer. We can get on there and vent, some managers respond with yukspeak, we kinda feel listened to, but nothing gets done, nothing is improved, and they have a benchmark of how many more cuts they can inflict without driving us all over the edge. You would have to be a fool to think any CX Engagement Survey is meant to be for the benefit the employees.